Abortion or rights to abortion or the right to kill a human being can they ever entail justifiable moral right? Considering abortion from a moral perspective must be one of the most contentious issues society has ever come to deal with. So I am not sure why I choose to write about this challenging subject, but still, I must be a glutton for punishment attempting to weave through this minefield. Some people hold the moral beliefs that their conscience tell them they are right. While others choose to believe that killing an embryo is morally wrong, but such opinions are not subject to proof. I shall, therefore, approach this difficult topic from several directions, legal and biological, in determining whether it is morally or immorally right to abort a child and to terminate the right to life. Then on to consider the importance of any implications that these points may raise such as contraception and of course cutting short a ' future'. The essential feature, however, is religion strictly to remain outside the domain of this article. To consider the moral case for Abortion, it is vital I would have thought to disengage emotionally from the subject but to start with the definition of 'Human' and to dismiss any possible confusion between the moral sense and the genetic sense. Taking this into account it makes it easier to decide as and when a human is a being acquiring full and equal moral rights and whether a foetus is considered enough of being a person to be a member of the community, hence possessing moral obligations. On the point of genetic formation, however, it is worthwhile to bear in mind that although a fertilised egg has all the genes code necessary to a human being but so do all cells of the body. Moreover, the beginning of biological life does not necessarily mean the foetus has an ipso facto the right to life nor from a moral perspective to decide what stage does an embryo becomes a being enough to acquire the right to life remains unexplained. Conversely, Pro-life supporters would argue that abortion is immoral and that the foetus is never anything other than human from conception. According to the Oxford English Dictionary Human is "designating a person who takes on the appearance or form, or who performs the function of a specified...thing; (also) designating an individual who assumes the appearance, role, or abilities of a specified creature." With that in place, the community also stipulates that it is wrong to kill innocent human beings, and fetuses are innocent human beings. It begs the question whether judgment here is prescribed in the moral sense or the genetic sense.? Since there is a difference or argument to differentiate between moral humanity and genetic humanity many would feel it is not essential to attach moral sense to an entity for merely possessing a human genetic code. A) Consciousness, in particular, the capacity to feel pain. B) Reasoning, the ability to solve new and relatively complex problems. E) The presence of self-concepts and self-awareness. Even the anti-abortionist would agree that an entity which satisfies none of the above is not deemed to be a person. To think otherwise they would be confusing between the genetic and moral sense of being 'human'. To determine personhood, therefore, for this argument at least, it is essential to consider the above five points as central, because the concept of people to have full moral rights hinges on their determination. In consequence, recognition of personhood is enough to recognise its moral right and indeed for the community to attach a moral right to it. Surprisingly, it would also be safe to say that genetic formation is not essential if the five primary criteria are present. To demonstrate, I borrow from Mary Anne Warren Report On the Moral and Legal Status of Abortion,"Genetic humanity is not necessary or sufficient for establishing that an entity is a person. Some human beings are not people, and there may well be people who are not human beings.Without significant mental capacity, as with some human being, kept alive but with consciousness permanently obliterated is no longer a person", a foetus may have human life form but not yet a person. So when do we consider a foetus developed enough to have acquired the necessary qualification for the community to attribute to it moral rights? Would it be when fully a person or being like a person and becomes sufficiently human to have the right to life? Here we are in deep water since neither medicine, philosophy or indeed theology has come up with agreed summation when life begins. In a landmark ruling by the United States Supreme Court on the issue of abortion, the court recognised for the first time that the US Constitution provides enough right to privacy. That it is "broad sufficiently to encompass a woman's decision whether or not to terminate her pregnancy", (Roe v. Wade, 1973). Such recognition also stresses a time limit, for protecting the potentiality of human life by tying permissibility for abortion to not later than the start of the third semester of pregnancy (27-40 weeks), a stage of pregnancy after which date abortion is unlawful. To recognise, the potentiality argument that by this date, the foetus more than likely feels pain so presumes the right to Life. 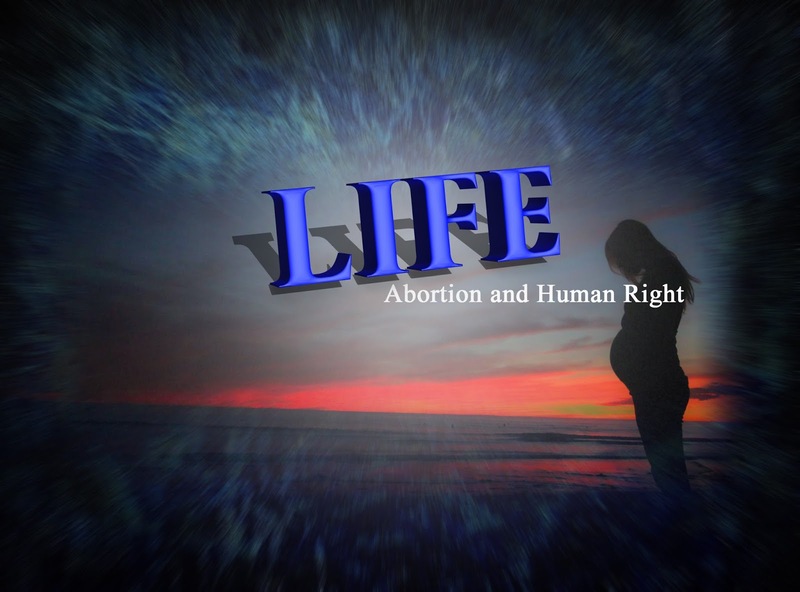 However, even though abortion was governed by a time limit, the ruling has unfortunately also come to be known by many as the case that legalised abortion nationwide. On this subject, there are also other twists and turns in store, since the moral question on Abortion does not end with concern for the foetus but it also ought to consider a pregnant woman's right to protect her own life. Some people would argue to abort a pregnancy to protect the life of the mother in the same way as in the circumstances for ridding the threat to human life. This concern must also evaluate the dilemma from a pragmatic perspective perhaps a severely mentally handicapped foetus or pregnancy a result of a woman raped. This challenging question, the right to abortion, must also take on board the pro-life argument, to boldly underscore why abortion is immoral. It would help to consider this side of the argument from a starting point of 'it is wrong to kill' (although this does not include the act of self-defence). Killing is depriving life or future life of the victim. To lose a life whether by an adult or a future life by a foetus must be one of the most heart rendering experience one can suffer. Depriving an embryo of life is to rob it of all the future values of life that entity might later enjoy. The embryo may be biologically or genetically not human enough but nevertheless, it is of human species with future moral worth, and some believe personhood. The wrongness of killing a foetus stands identical with the killing of adults that also deprives them of a value of their futures. By all assessment, this is a compelling argument, however, below in my conclusion, to some extent, I attempt to mitigate its force. Future value of life argument need not put a spotlight on family planning which for many can also seem to deny a future by contraception. The short answer for this must be before conception, there are millions of sperms. Hence there is no identifiable subject of the loss. In conclusion, I must admit by the limited tenets presented here I am no nearer in resolving this issue. However, reluctantly I go on the side of the gradualist or moderates abortionists providing certain provisions are met Considering, the difficulties as presented here deciding when the right to life starts one can assume that the progress to personhood and the right to life increases with the period of gestation. Taking into account that although the foetus may be of a human life form, it is not yet a person, so the gradual argument therefore largely determines the justifiability or the none-justifiability of having an abortion. The alternative view of pro-life proponents would be unwanted pregnancies, illegal abortions and the risk of death for mother and the unborn. Therefore, the legislators in their effort to ward off any subjective principles they have shown they are morally bound to take a consequentialist approach to ethics. Moreover, given that the risk of death increases with the length of pregnancy on health ground for both and hopefully keeping on the right side of the moral argument the judgment of Roe v Wade sums it about right. Since part of the merit to this ruling must be the idea of the foetus has reached a particular stage of development when it is liable to be hurt, an unconsented hurt, they then must acquire moral right.